As mentioned previously on this blog, we have the great privilege of showcasing some of Darrell Godliman's photographs of Oxford on oushop.com. Here, Darrell shares some thoughts on his photographs, photography and on Oxford. Oxford is the place I call home (despite now living in Witney), I’ve come to know it so well and I have photography to thank for that. The act of intensely looking at the city has given me a greater insight and appreciation, I often find myself thinking how lucky I am to have found myself here. What is your favourite Oxford view? I lived in Headington for a number of years and often walked into Oxford so I have a particular affinity with the view of the ‘Dreaming Spires’ from South Park, it’s the perfect place to sit watch the sun set on a Summers evening. 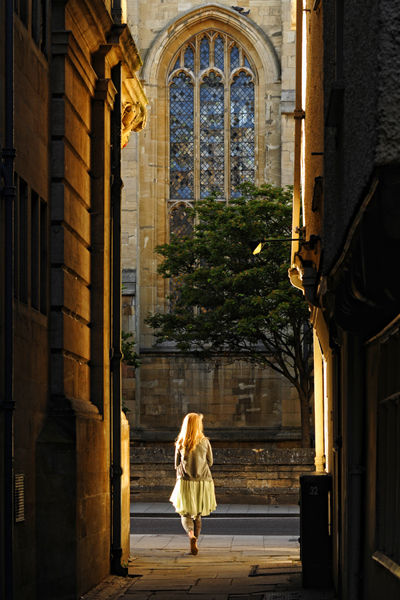 Within the city centre the Radcliffe Square is superb for photography but some of my favourite shots have been taken down the network of lanes that lead from there such as Brasenose Lane and New College Lane. Which other locations have you most enjoyed photographing ? Generally my favourite photographic memories are wandering round large cities at sunrise, ideally on a Sunday morning when it’s possible to have the city to yourself. These ‘dawn raids’ are something I will always make the effort for and rarely am I disappointed. Even when the weather is less than perfect it is wonderful to see a city like Rome or Prague as they gradually start to come alive. It’s something I’d recommend to everyone. What most inspires you in your photography? Do you have a ‘best shot’ or favourite photograph? My favourite photographs change constantly but increasingly my favourites are the ones where I find a new angle on a familiar sight. It can be a combination of lens and viewpoint or maybe an unusual post-production technique. As my Photoshop technique improves I am also rediscovering long forgotten photographs and reworking them with a new palette of techniques. What is your essential photography kit – the stuff you don’t leave the house without? Do you have any hints or tips for capturing the feel or atmosphere of a city through photography? I try to always have a camera with me as you never know just when you might have the right combination of subject and light. Once I’ve found a scene I’ll wait for an appropriate person to walk through it, taking several if I feel it’s necessary. Sometimes it’s the ‘actor’ that’s the main subject; sometimes the person is merely playing a ‘bit part’ in a much larger scene. My recent photo ‘Alice’ is an example of this. When I’m travelling I try to take photographs of everything, not just the buildings, particularly so when I’m travelling outside of Europe. People are obviously important but I enjoy taking photos of all the details, whether it’s the food in a restaurant, unusual types of transport etc, they all contribute to what makes a place intriguing. Which photographers most inspire you? Probably the biggest influence on me is a photographer called Charlie Waite. Ironically he’s best known for his landscape photography, something I rarely do myself, but he produces deceptively simple, quite formally composed shots in which the quality of the light is paramount. At the other end of the photographic spectrum I love the work of Magnum photographer Martin Parr. You can see more of Darrell Godliman's photography on flickr and on his own website.